Arliene Ely Obituary - Elkton, Maryland - R.T. Foard Funeral Home, P.A. Arliene Katherine Bellini Ely of Elkton, MD, age 86, passed away Sunday, March 31, 2019. 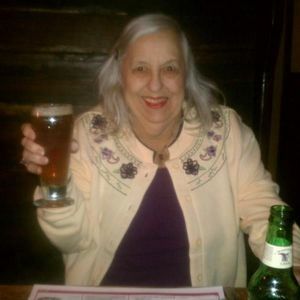 She was born on February 7, 1933 in Shamokin, PA to the late Joseph John Bellini, Sr. and Margaret Mae (Ramp) Bellini. Arliene was preceded in death by her much-loved husband Arnold Ely, daughter Lynda Elrod Simpson, former husband Arthur Elrod and brother Howard Bellini. She is survived by her son, Donald Elrod, his wife Dorothy, their daughters Shaunti Elrod Szwed (Chris), Lacey Elrod Nazarian (Hovik) and new great-granddaughter Ava Rose; son-in-law Stephen Simpson, Simpson grandchildren Teresa (Liz), Steve (Andrea), Jim (Melinda), Jarrett (Kathryn) and John (Lauren), and great grandchildren Lynn, Ashton, Autumn, Nicholas, Joshua, Samara, Alana and Gannon; and her siblings Joe Bellini (Barbara), Val Grady (Dale), Sandy Steuber (Phil), and James Bellini (Hong Anh), as well as seven nieces, nephews and their children. Arliene doted on her family and was incredibly proud of her children and grandchildren. She never missed one of son Don's football or baseball games and kept every news clipping continuing to brag about him and share those clippings with her grandchildren. She took daughter Lynda to dance lessons for years and was her Girl Scouts Troop Leader. She brought granddaughter Teresa to ice-skating lessons and competitions, meticulously scrapbooking every memento. Arliene was always interested in and concerned about what was going on in her loved one's lives, asking lots of questions and sharing any news with the rest of the family. She was incredibly supportive and was happiest when her loved ones were happy. Arliene loved to travel, especially to the Caribbean and Mexico, but anywhere she could be with a beach, a good book, some crab cakes and shrimp! She and Arn took many of their grandchildren on their travels and always encouraged exploration, adventures and trying new things. She also loved to entertain people with her eccentric, perhaps embellished, stories. She was a great storyteller with a knack for details. Arliene was an avid reader too; devouring books faster than her favorite authors could publish. Our apologies to all the libraries in places she lived as many books might not have made it back! And no telling of her life would be complete without acknowledging her faithful, furry companions, especially her beloved Sidney then Nikki who were a great joy to her in her later years. Her family will hold a private celebration of her life Saturday, April 6, 2019, in Elkton followed by a future gathering in South Padre, Texas, Arliene & Arnie's paradise home for several years. Add your thoughts, prayers or a condolence to Arliene's guestbook. Please enhance this tribute to Arliene by adding your memories and photos.